A two flute bearing guided cutter with an elliptical ovolo profile. 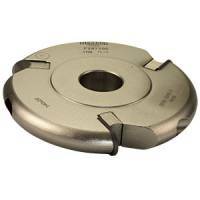 The cutter is an exact match of the thumb mould T1372½ but in a vertical form. 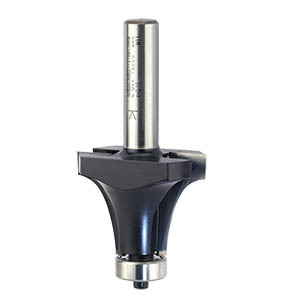 The cutter is primarily designed for the top moulding of easing pieces on stair handrails. In conjunction with the T1372½ cutter handrails, easing pieces and wreaths may be produced. Other uses may include skirtings, architraves, etc. 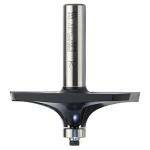 The cutter is supplied with a TB748 bearing fitted and alternative bearings may be selected from the table (click the Optional bearings... link) to vary the quirk dimension "G". Optional bearings should be selected from this table and then ordered from the Bearings and Spares section of the catalogue.